I’m typically not one for aphorisms though, lately, I have found them more than a little useful. I’m not sure if it is my life/career stage that has me searching for larger truths, or simpler modes of explanation, or broader contextual frameworks, but I have noticed that I have found solace in them as of late. In any event, my life/career stage has also made me meditate, to a degree, about death – and, in particular, my death. Please understand, I do not feel death stalking me and I am not currently suffering from any malady (as far as I know). Rather, I wonder if it is perhaps a condition of recent parenthood, a comfortable career path, and realization that there are more miles behind than ahead, that have made me think about my own demise more – or, rather, what I wish to do with the time I have remaining. To paraphrase a character from the film Before Midnight, “Every year I get a little more humbled by everything I don’t know and will never learn.” I still have the desire (and, hopefully, ability) to grow and to learn, and I’ve always known we have a finite amount of time to do what we need and want to do, but perhaps I just didn’t internalize this contradiction until recently. Of course, it had to be a sports metaphor, and have something heritage-esque about it (and from a book I greatly admire and wrote about here a few months ago), but it does remind me to play the game – as best as I can – because, indeed, one day it’ll be over. 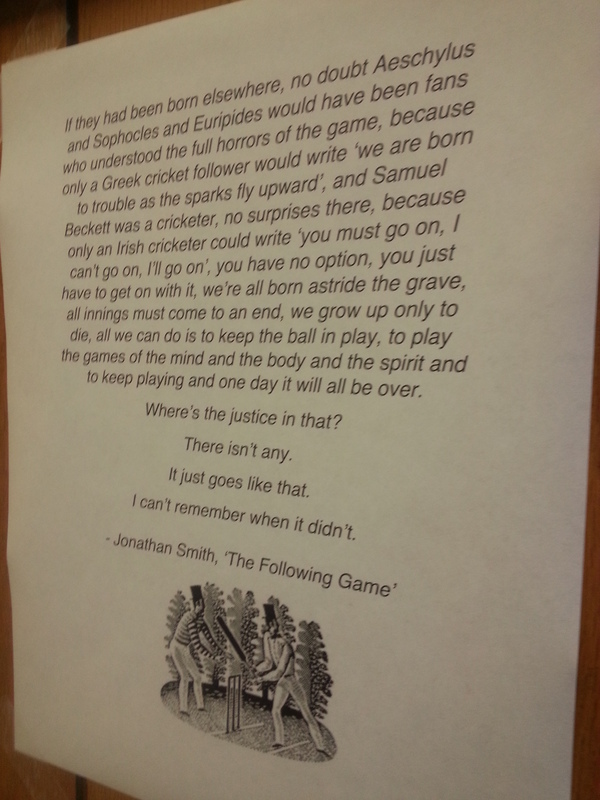 Since posting it in my office a few weeks ago, I can’t say that reading this quote has necessarily made me a better researcher, teacher, father, partner, sportsman, or colleague – but, rather, it has made me appreciate what I have and what I have done, while still realizing that there are still runs to get, shots to play, and victories to be won before the “close of play”, as it were. Strangely, reading this quote (often several times a day) has been more comforting and calming than it has been depressing – and, I think I may have needed that sense of serenity as of late. At any rate, please forgive the indulgence of this post – I will return to discussing more sport heritage issues, topics, and research and fewer existential meditations on mortality (and, as The Guardian recently posted, it might be best to retire certain cricket metaphors anyway). By Gregory Ramshaw in Uncategorized on November 6, 2013 .